Allison Williams and Lena Dunham’s beautiful celebrity styles made us do a double take this week! We’re telling you why in this week’s installment of Friday’s Fashion Obsessions. To fete the Season 3 premiere of Girls in New York City, Allison Williams worked the red carpet in a pretty pale blue party dress. There was a lot of star power at the event, but it was Allison’s embellished fit and flare dress we couldn’t take our eyes off of. I have to give major fashion props to Allison for braving the cold NYC temps in this skin-exposing ensemble. Any girl who can rock a sleeveless dress without tights in the winter and not look like she’s about to freeze to death is a true fashion warrior! Pastels are typically a hot summer color but they’re back in full force this winter, and Allison works the delicate hue with ease by adding a winter-ready berry lip, metallic pumps and a sleek ‘do. The final verdict? 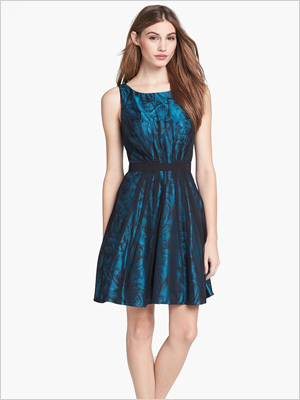 The blue color has a fun ice princess vibe I’m really digging. If you can’t bear the thought of baring this much skin (we don’t blame you!) this winter, add a pair of opaque tights and warm blazer or overcoat and you’ll be channeling Allison in no time. Lena Dunham should be feeling pretty good about herself this week! 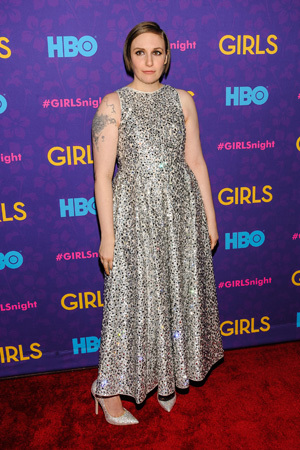 Her hit show Girls is premiering its third season, and she ruled the red carpet in this sparkly stunner. Pretty great week, huh? We’ve long been fans of Lena for her realness and her approach to beauty, but she really outdid herself with this embellished gown. It highlights her figure, lets her shine (quite literally) and oh yeah, it looks really comfy too. When paired with some strategic accessories, Lena looks regal from head to toe thanks to a sleek ‘do and those fairytale-worthy shoes. The final verdict? Keep it up, Lena! We like this fashion direction you’re taking! Go on and shine like the creative genius we all know you are.